FirstWord Lists: Which companies pay the highest US rebates and which companies are most dependent on US drug price increases? In recent weeks, US drug list prices – and in particular the trend for substantial price increases – have become a popular subject in mainstream media coverage of the pharmaceutical sector. But what proportion of these prices are retained by drug manufacturers and what proportion are passed onto the payer community in the form of rebates? A recent analysis of gross-to-net sales across 15 US and EU-based large cap pharmaceutical companies by analysts at Credit Suisse suggests that AstraZeneca provides the highest level of US rebates, giving back over 50 percent of gross US sales to payers. Combined, these 15 players recorded net US sales of $133.5 billion and total rebates of $76.5 billion. A 10 percent year-on-year increase in US rebates versus a 2 percent year-on-year decline in US sales illustrates the impact of increasing US formulary pressures (highlighted by a number of high-profile drug exclusions from preferred formularies in 2014) - Spotlight On: Q1 results provide first glimpse of success for US formulary blocking tactics. Six profiled EU-based companies recorded combined rebates of $38.7 billion versus combined SG&A expenditure of $18.4 billion in 2013, compelling analysts to declare "US rebates as effectively the biggest single element of promotional expense in the sector" – with regard to influencing payer formulary decisions. 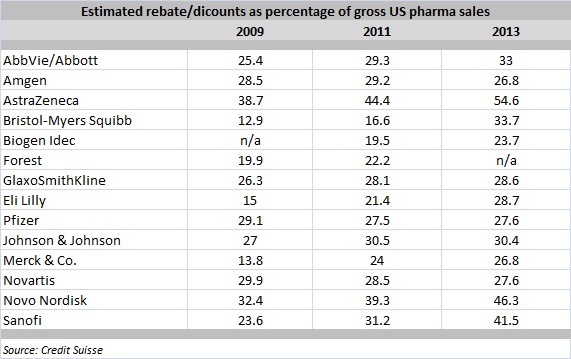 With average US list prices up 12 percent year-on-year in Q1 2014, net pricing remains a key driver of pharma growth in the US despite growing rebates. A higher level of portfolio uniqueness – defined by Credit Suisse as products which face two or fewer direct competitors and sustainable drugs that either face little threat from generic competition or continue to generate notable sales despite patent expiry – remains the most important deterrent against US pricing pressure. AstraZeneca's high contribution to rebates reflects "the lack of uniqueness in the current portfolio and the requirement to rebate extensively" note analysts at Credit Suisse. Specifically, they cite Crestor and Nexium, which compete with generic Lipitor and generic Prilosec, respectively. In an analysis of product-level rebating published in Forbes in 2012, Matthew Herper noted AstraZeneca's Nexium, Seroquel and Crestor among the 10 most rebated drugs in the US. Credit Suisse analysts conclude that Lundbeck, Shire and UCB are the most leveraged companies to US price increases among the large/mid-cap peer set. FirstWord Lists: Which biologics face the most competition from biosimilars?